A mixture of sugar, water and cream of tartar which is used for decorating cakes. There are two different types of fondant; poured fondant which can be used to fill or decorate cakes and candies (the filling of a Cadbury crème egg is poured fondant) and fondant icing, a pliable icing which can be rolled out to cover a cake. Different colourings and flavourings can be added. A delicious chocolate fondact with a subtle kick of piment d'Espelette. A delicious chocolate dessert with a melting centre - a perfect ending to many a meal! 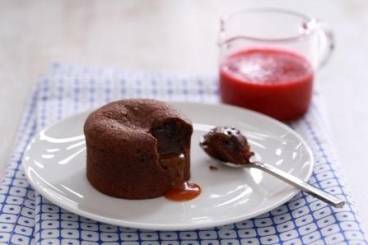 Biscuit fondant au chocolat accompagné d'une crème anglaise parfumée à l'alcool de genièvre. A melt in the mouth chocolate fondant served with praline emulsion and an almond tuile. 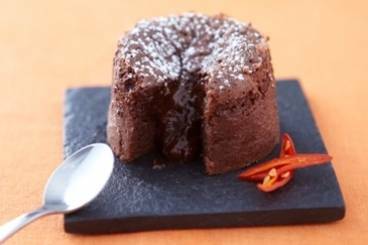 We've simplified the recipe for chocolate fondants, so you only make what you need. You still get a gooey-centered cake, however many time you multiply the recipe. Chocolate fondant with a salted butter caramel in the centre served with a raspberry coulis. A rich and gooey chocolate chocolate dessert with a touch of heat. Dark chocolate fondant with gianduja served with a pistachio cream. 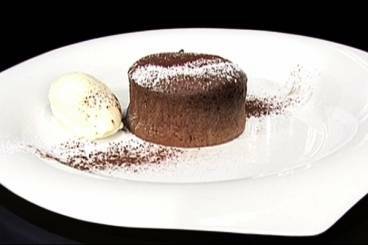 A melt in the mouth chocolate fondant served with a rich caramel sauce and a creamy coffee emulsion. If your custard is overcooked, blend it for 30 seconds.